A selection of itineraries taking you from Chiang Mai to Chiang Rai and around the Golden Triangle area. Our two day tours to the Golden Triangle and Chiang Rai offer you a range of itineraries which take you to explore; Mae Sai, on the border of Myanmar & Thailand; Chiang Saen, on the banks of the Mekong River; Chiang Rai, the main town of the upper north of Thailand; Mae Salong , the Chinese settlement located in the hills of the upper north; as well as all the special sights. Sights along the way include, elephant camps, ancient cave temples, Padong (long neck) tribe, hilltribe villages, boat trips on the Kok and Mekong Rivers, elephant trekking to remote villages and overnight stays in hilltribe villages. Please just see the itineraries to find the one which includes your favourite sights and places. Day 1 Drive from Chiang Mai to Chiang Rai (approx. 3 hrs) stopping at the hotsprings along the way. After lunch take a boat trip along the Kok River (approx. 1 hr) to the elephant camp. At the elephant camp, we mount our elephants for the ride up to the Lahu hilltribe village where we spend the night. It's a ride of approx. 2 hrs and the leisurely pace means we can enjoy the scenery along the way. Spend the night in a Lahu hilltribe village. In the evening there's time to wander around the village and your guide will tell you about the Lahu culture. Day 2 In the morning walk approx 1 hr. to a forestry camp and from there drive to see an Akha village. After exploring the Akha village drive to the Burmese border town of Mae Sai where you will see the bustling trade that goes on every day. This is a market town so there's a chance to shop for souvenirs - including jade and handicrafts. After lunch drive to see the Golden Triangle and Chiang Saen, on the banks of the Mekong River. See the point where the three countries of Burma, Laos and Thailand meet and the ancient temples of Chiang Saen. Afterwards in the late afternoon, drive back to Chiang Mai. All entrance fees and activities as mentioned. Day 1 Drive from Chiang Mai up to Chiang Dao (approx. 1 hr.) and stop at the elephant camp. After watching the elephants demonstrating their skills, take a ride and admire the view from your seat on the elephant's back. 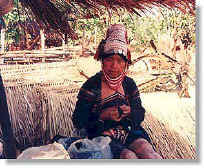 Then explore some hilltribe villages and learn about the cultural variety of the area. Two of the tribes you will see are the Palong and the Lisu, two of the most colourful and interesting tribes. Then drive on to Taton and after lunch take a longtail boat from Taton to Chiang Rai. You will be able to see the scenery and life along the river banks. The boat journey lasts for approx 3 hrs. We finish the journey in Chiang Rai, which is where we spend the night. Day 2 In the morning explore the temples of Chiang Rai, including Wat Phra Kaew. Then drive up to the Burmese border at Mae Sai and spend some time to explore this bustling market town. From here drive on to the Golden Triangle and Chiang Saen on the banks of the Mekong River. See the point where the three countries of Burma, Laos & Thailand converge as well as the ancient temples of Chiang Saen. Late afternoon, drive back to Chiang Mai. Day 1 Drive from Chiang Mai up to Chiang Dao (approx. 1 hr.) and stop at the elephant camp. After watching the elephants demonstrating their skills, take a ride and admire the view from your seat on the elephant's back. 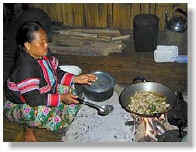 Then explore some hilltribe villages and learn about the cultural variety of the area. Two of the tribes you will see are the Palong and the Lisu, two of the most colourful and interesting tribes. Afterwards drive to the Chiang Dao Caves, an ancient network of caves that have been used as temples for many centuries. Stop for lunch in Taton and climb up to the temple that overlooks the river, it is distinguished by its large Buddha statue that is situated on the hillside. Drive on to the Chinese town of Mae Salong, where we spend the night. Day 2 Explore the town of Mae Salong, with its morning market, Chinese culture and nearby hilltribe villages. Then drive to Mae Sai and spend some time to explore this bustling market town. From here drive on to the Golden Triangle and Chiang Saen on the banks of the Mekong River. See the point where the three countries of Burma, Laos & Thailand converge as well as the ancient temples of Chiang Saen. Late afternoon, drive back to Chiang Mai. Accommodation in Chiang Mai - online hotel booking service with discounted rates.